Repurposed from its primitive workwear function, the jacket wins in style and chic. Cut in an incredibly soft and comfortable fabric. Straight cut jacket. Small collar. Button fastening and 3 patch pockets at front. Button cuffs. Play of seams and toe-on-tone topstitching. Length 61.5cm approx. 69% cotton, 29% Lyocell, 2% elastane. 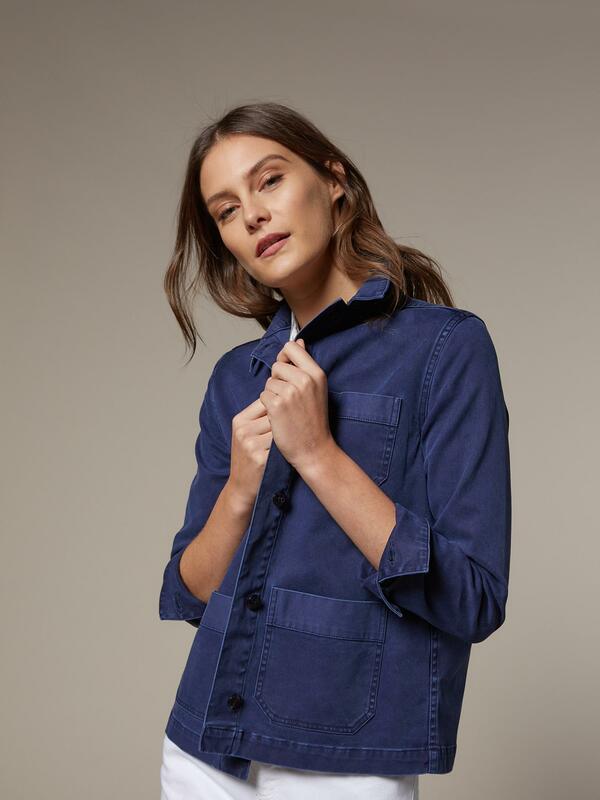 Made in a manner which respects the environment, Lyocell is a fibre produced from wool pulp which requires no toxic products in its treatment. After transformation, this fully biodegradable fibre presents excellent characteristics: high humidity absorption, freshness and flexibility. It is wrinkle resistant and as easy-care as man-made fabrics. Paired with cotton and elastane for even greater softness and supple comfort. A Cyrillus women's jacket is an essential piece that you'll wear daily for work or on dressier occasions: a suit jacket or boxy jacket for work, a padded jacket for the weekend, a tuxedo jacket for evening wear. The choice is yours!